Voices of the Forest is a choir with a focus on the joy and the inspirational quality of singing and on sharing this joy with others through performance. The atmosphere in rehearsals is cheerful and informal and the exuberance of the singing is combined with a willingness to stretch everyone's abilities to achieve the finest possible sound. We are happy to welcome new members to join us and prospective members are invited to attend a free 'taster' rehearsal session to see - and hear - what we are about. Please contact us if you are interested. To achieve our aims of joyful and inspirational singing we need to ask that members agree to a few simple conditions, as detailed below, which should in no way impair the fun and enthusiasm we all feel for our choir! We meet weekly on Tuesday evenings during term time at Colbury Memorial Hall (in Colbury, Totton, SO40 7EL - near Ashurst - https://www.colburymemorialhall.uk) and we are all committed to attendance at a minimum of 80% of sessions and to arriving promptly for a 7.30pm start. Additionally, members are strongly urged to attend monthly 'sectional' sessions (i.e. sessions with the MD - musical director - exclusively for their own section of the choir - soprano, alto, tenor or bass). It is expected that members will commit themselves to performances which are proposed by the MD and agreed with members. It is also expected, as a condition of performing, that members attend at least the final 3 rehearsals leading up to each performance. 6 to 8 performances per year are anticipated. To help us manage our finances, fees for Tuesday evenings and sectional sessions need to be paid termly or halftermly in advance. New members need not pay for their first evening. 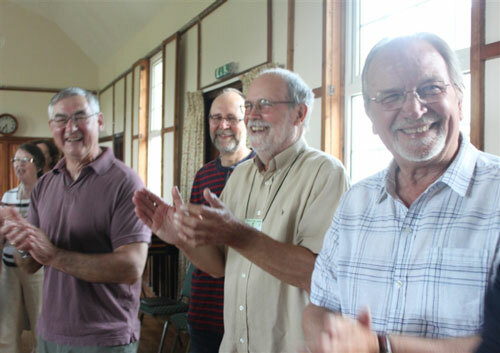 Members need to enjoy learning techniques to maintain and improve the quality of our singing. We must all recognise that teaching will require some silence and show courtesy to other members and the MD during the teaching. Day to day management of the choir is undertaken by a small committee. Decisions as to the direction of the choir are the responsibility of the MD, in consultation with the committee and members. Our repertoire is decided by the MD. He is happy to listen to the views of members within reason, but final decisions are made by him. It will include world music, folk songs, spirituals and dips into opera, classical and contemporary genres. Some material will be more challenging, and will need our enthusiasm and commitment! The singing is mainly, though not exclusively, unaccompanied. We review the progress of the choir on an on-going basis. We aim to increase our membership in a controlled way, to achieve a satisfactory balance of numbers within each part (SATB). There is no requirement for new members to have had previous singing experience or an ability to read music. Permanent admission to the choir is at the discretion of the MD in discussion with the committee, usually after a 'settling in' period of half a term.